Anyway, I decided to only do the 60 mile ride today instead of the 80 miler. For those that know me–that’s conservative for me! Because I never want to miss one sight on a trip like this. While my overnight recovery was good, I want to do the next 2 day long rides of about 90 miles each, and us more experienced guys know how to pace ourselves. The weather was still threatening, but we hoped for a change. It’s still cold but not raining. The day improved from the getgo and got sunny around 3 pm. No rain. Yeah! It’s still cold. There is snow just on the mountain tops and riding is cold. See the picture. I did finally take the sleeves off my windbreaker though. 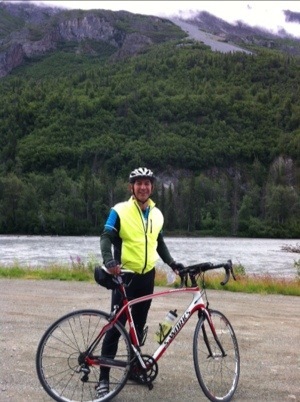 The first 40 miles were absolutely gorgeous farmland in a valley filled with thriving farms and homesteads. They are in the middle of very rugged nowhere, but the views of the mountains they enjoy everyday are breathtaking. We had lunch in a terrific little campground to stock up on the energy we’d need to spend the next 14 miles climbing up a mountain 2,500 ft high. While yesterday was more foot gain in terms of climbs, today it was just long, steady, slogging 5 to 10% climbs. I’ve attached a picture of the summit. It was awesome-both the climb and the views along the way. Burned about 4800 calories today and 4200 yesterday. I’m eating anything in sight now and still losing weight. 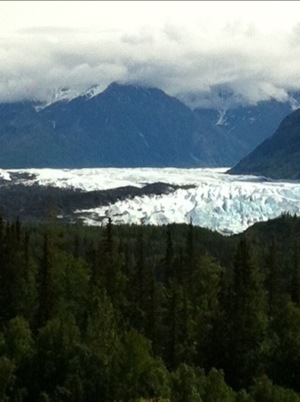 One of todays top views was of Matanuska Glacier. Our ride took us within a 1/2 mile of the face. 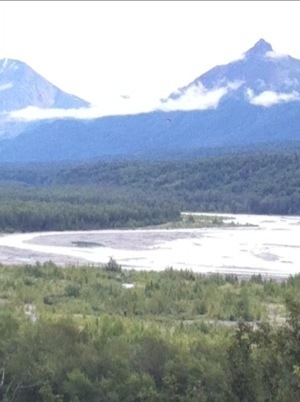 We followed the glacier flow basin all day. It was cool to see where the flows were coming from. Incredible sight. See the picture. It’s 27 miles long and begins in Palmer where we started yesterday, and terminates in Sheeps Mountain, where we are spending the night tonight. Not many people see that sight from the vantage of a bike seat. This picture alone was worth the trip! Then there was an unbelievable descent 6 miles long! My top speed was 46 MPH. You cannot imagine the thrill of doing that kind of speed on a bike until you’ve done it. It’s like a roller coaster without the seat restraining bar. Finally, we are staying at Sheeps Mountain Lodge. See the picture. 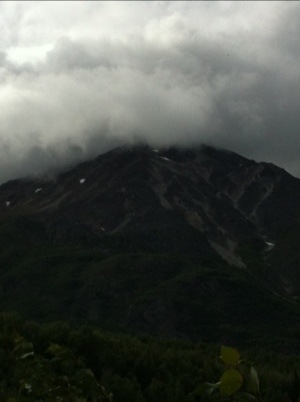 It’s way up here in Alaska. 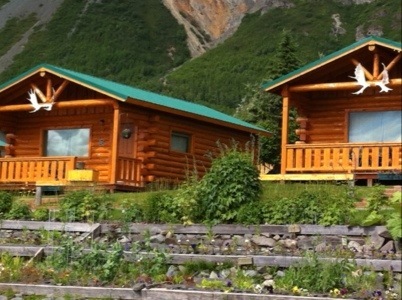 Gorgeous views from our log cabin room. That’s it for today. Hope you are enjoying the blog. Lou is the altitude affecting you? Take it easy and rememeber that you can return on your plane. I’ve already shifted back. There were 4 options from 38 miles To 88. I’m doing the long 88 miler today. This is shifting back! 88 miles!!! why not 33!